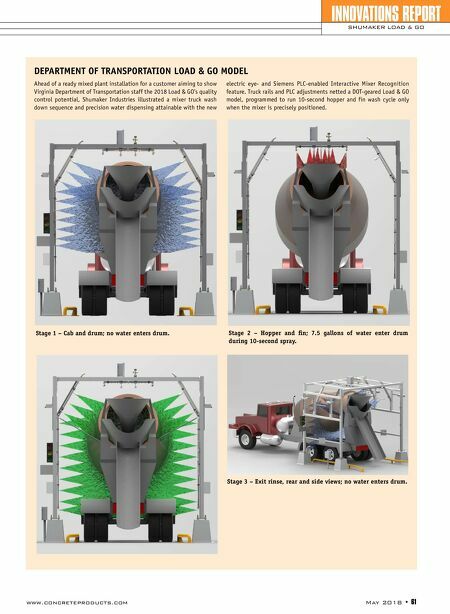 www.concreteproducts.com May 2018 • 61 INNOVATIONS REPORT SHUMAKER LOAD & GO Stage 3 – Exit rinse, rear and side views; no water enters drum. 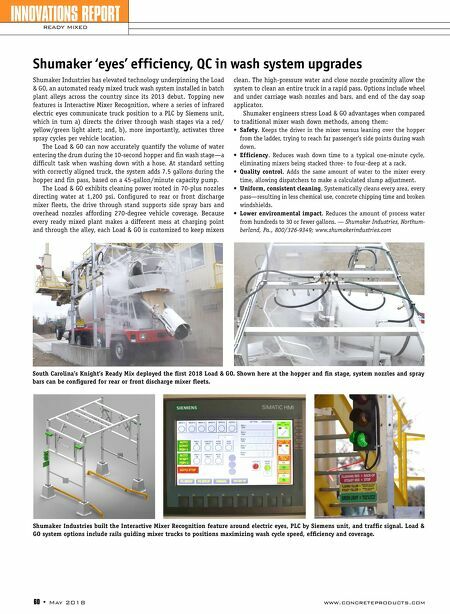 Ahead of a ready mixed plant installation for a customer aiming to show Virginia Department of Transportation staff the 2018 Load & GO's quality control potential, Shumaker Industries illustrated a mixer truck wash down sequence and precision water dispensing attainable with the new electric eye- and Siemens PLC-enabled Interactive Mixer Recognition feature. Truck rails and PLC adjustments produced a Virginia DOT Load & GO model, programmed to run 10-second hopper and fin wash cycle only when the mixer is precisely positioned. VIRGINIA DEPARTMENT OF TRANSPORTATION LOAD & GO MODEL Stage 2 – Hopper and fin; 7.5 gallons of water enter drum during 10-second spray. Stage 1 – Cab and drum; no water enters drum.